Senior members of the Eda Hareidit want to make it abundantly clear that the Neturei Karta sect does not represent their views. 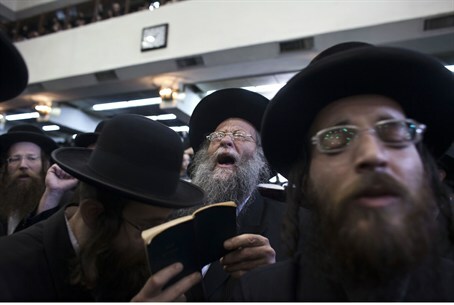 Members of the hareidi-religious Eda Hareidit council expressed anger Monday at the extremist anti-Zionist Neturei Karta sect, and clarified that they are not in any way connected. “Our problem is that the media identifies them as members of the Eda Hareidit. [Eda Hareidit] has come out against them in an official letter, so how can it be said that they are a part of us?” a senior Eda Hareidit member said, speaking to Kikar Hashabat. Delegations from the Neturei Karta have often traveled to Iran to attend Holocaust denial conferences in Tehran, and to meet with President Mahmoud Ahmadinejad. Last Friday, members of Neturei Karta reportedly participated in an anti-Israel march from Jordan, but were attacked by the Jordanian Arabs they were marching with. The tiny Jewish extremist fringe movement believes the Messiah cannot arrive while Jews are in control of the Land of Israel, and while the current State of Israel exists. The anti-Zionist sect's hassidic attire makes it easy to generalize, however, and make its members seem more numerous and thus more important than they really are.